Welcome to the EDUC61712: Media and Information Literacy course, run by the School of Education, University of Manchester. It is part of the portfolio of courses offered on the MA: Digital Technologies, Communication and Education, but it can be taken by students on other courses at Manchester by selecting it in the usual way. If you are not a registered student at the University of Manchester, you are free to look at these materials, but please read this page first. 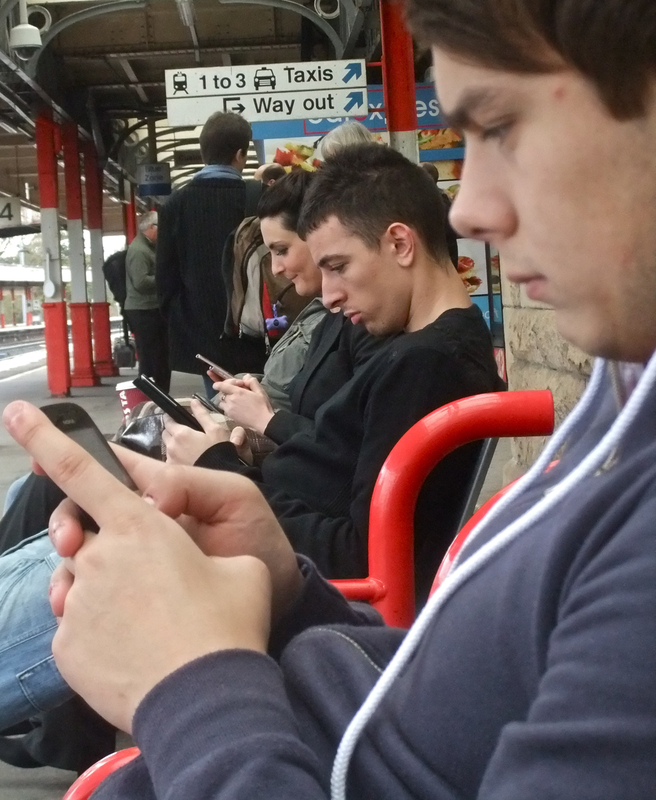 Three people sat immersed in their mobile communications devices, Lancaster railway station, 11/10/11. This course will discuss, amongst other things: what is the impact of this ubiquitous ICT on how we learn? This course is structured rather differently to most others you will have taken, particularly if you are a distance learning student. There is no progression of weekly topics, as such (though there are some things you need to do early on, and some things you should leave until later in the course). Distance and on-campus students alike should therefore start with the Introduction. Once you have read that, you can explore the course at your convenience. Introduction. All students should read this first. Judgments about information. This is a key resource. Do not expect to absorb and understand it on one visit. You may need to revisit and review this material a few times. The literature. A significant teaching method on this course is your reading. You will be visiting this page frequently and reading several of the articles listed here. These readings are linked to one of the core activities. Core activities. All students will complete these activities, and they are compulsory. All core activities have to be completed by a specific point in the course. This page also outlines the course assignment. Video-based materials. This course uses a range of video-based materials; mainly short ‘Prezicasts’, but also some other movies. These are all listed on and linked to from this page. Remember there is also a limited Blackboard 9 presence for this course. The BB9 site contains some of the links pages used here and bear in mind these are from an earlier version of the course so lack some of the more up-to-date readings. The main thing it has that this site does not is the assignment submission system (as that must be password-protected). It also has a discussion board and links to the Adobe Connect rooms we’ll be using for the synchronous sessions. You will need your University of Manchester ID and password to enter the room. Non-Manchester readers: These materials are open access and released under a Creative Commons license (CC BY NC SA), which basically means that they can be reused and republished anywhere for non-commercial purposes and as long as they are republished under the same license. Anyone is free to read them, but unless you are a student at Manchester registered on the course unit, we can’t enter into communication about the academic content of the course, mark or grade any work, allow access to Blackboard, and so on.